Mossy Point photo by James Hoggard. 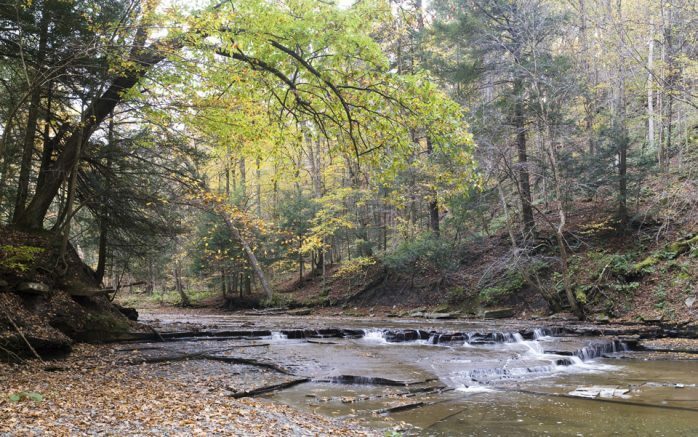 Thanks to more than $1 million in funding from New York State, the Western New York Land Conservancy is now one step closer to protecting the Mossy Point Forest in Wales. These funds, awarded through the NYS Consolidated Funding Application, or CFA, will also allow the Land Conservancy to embark on the next phase of the DL&W nature trail and greenway project in the City of Buffalo. A source water protection grant through the Water Quality Improvement Program of the NYS Department of Environmental Conservation will put $655,969 toward the Land Conservancy’s acquisition of the privately-owned Mossy Point Forest in the Town of Wales. This 222-acre forest is located between the Land Conservancy’s Kenneglenn Nature Preserve and Hunters Creek County Park. Once the Mossy Point Forest is protected, these three adjacent properties will form a massive intact 1,100-acre tract of protected forest. This area is of critical importance to the region’s water quality as a headwater forest of the Niagara River. The forest provides excellent wildlife habitat for creatures big and small, prevents erosion and sedimentation into Hunters Creek, and recharges and filters groundwater. Land Conservancy supporters have already donated approximately $84,000 to protect the Mossy Point Forest, but in order to purchase the land and open it as a publicly accessible nature preserve, they must raise an additional $860,000 before the end of 2019. The Land Conservancy also received a grant for $369,000 through the CFA from the NYS Office of Parks, Recreation and Historic Preservation to create concept and schematic designs to transform the abandoned DL&W rail corridor into an inspiring nature trail and greenway project that connects downtown Buffalo at Canalside to the Buffalo River as it runs through the Valley, Old First Ward and Perry neighborhoods. The corridor is owned by the Niagara Frontier Transportation Authority (NFTA). The Land Conservancy has already completed the first phase of the project, a year-long visioning process that created a community vision plan that guides the future of the DL&W corridor. Phase two is underway now — an international juried Design Ideas Competition. Close to 200 professional and student designers, architects, landscape architects, urban planners and artists from every corner of the globe have already registered to participate in the competition. More detailed information about this exciting phase of the project can be found on the Land Conservancy’s website at wnylc.org/dlw-design. Those wishing to participate in the competition must register by emailing dlw@wnylc.org. There is no cost to participate. Submissions are due by Feb. 15, 2019 and winners will be announced this spring. Monetary prizes will be awarded to winning submissions. If you are interested in learning more about the Western New York Land Conservancy’s work, contact the office at (716) 687-1225 or info@wnylc.org. If you would like to support the permanent protection of the Mossy Point Forest or the DL&W projects, you can donate online at wnylc.org or send a check to P.O. Box 471, East Aurora, N.Y. 14052. Be the first to comment on "WNY Land Conservancy awarded over $1 million in state funds"